Exercising in water makes you feel about 90 percent lighter ! When you jump or run in the water, your body does not experience the same impact that these moves cause on land. This makes water aerobics an ideal activity for those with arthritis, back problems, foot or leg injuries, and knee conditions. Pregnant women and the obese also benefit from the reduced impact. Expect to burn between 400 and 500 calories per hour in a water aerobics class, according to the Aquatic Exercise Association. The actual amount you burn will depend on your size, the intensity of your movements, as well as water temperature and depth. 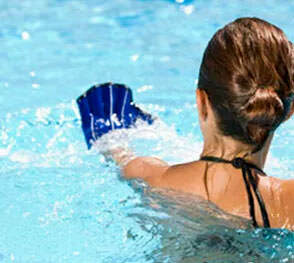 In general, faster movements incorporating the upper and lower body in deep water elicit the greatest calorie burn. When exercising in water, you work against 12 times the resistance of air. Simply kicking and cupping the water helps contribute to muscle development, which translates into a higher metabolism and healthier body. 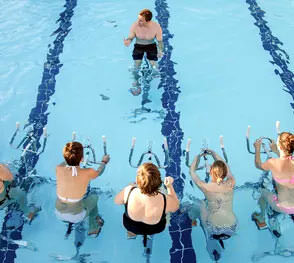 Many water aerobics classes incorporate equipment like water paddles, noodles, Bike, trampoline, and kickboards to further induce strength gains. 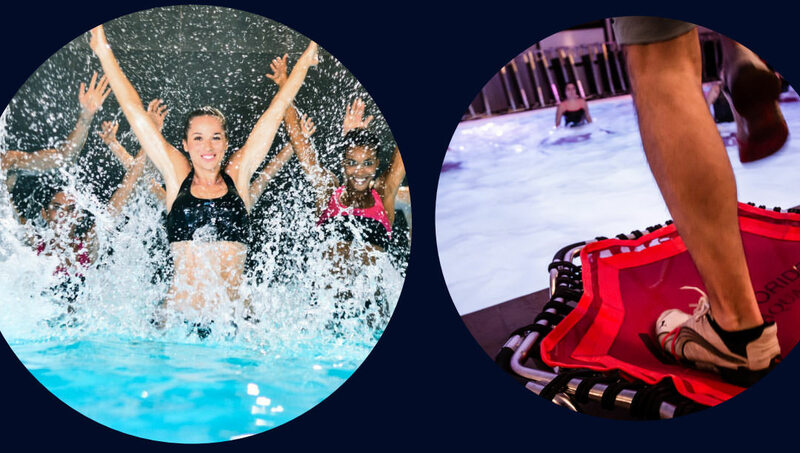 Aquafit strengthens muscles, increases heart rate and improve breathing tonus and blood flow. In addition to all those benefits which any sport can have, the advantage of aquagym is that is "non traumatic". Unlike many land-based activities, the risk of injury is minimal. The resistance of water prevents pulled, strained and sore muscles. All shocks are cushioned, there is no impact with the ground. Aquaboxing is a tonic sport inspired by martial arts. It's a form of body combat practiced in the water. The Aqua Boxing course provides excellent endurance work. Indeed, working in the water, we carry little or no weight at all, depending on the depth of the pool. Aqua Boxing takes place in music and the sessions are specially designed to strengthen the cardiovascular system. Just take everything you love about spin—intense cycling, unorthodox arm and chest exercises performed on a bike, inspiring music, instructors who never stop smiling—and add salt water, swimsuits, and enough resistance to make you feel like you have weights strapped onto your body. It's grueling, effective, and totally therapeutic. Aquabike can be adapted to suit various fitness needs and levels. The aquajump comes from Brazil and involves jumping on a trampoline in the water. It helps eliminate excess fat, but also strengthen the abdominals, shaping the buttocks and toning the legs. This activity also improves his sense of balance and motor skills. The advantage is that this sport is accessible to all, regardless of age. NB: Water shoes could give you more comfort. Token are available at the VUB reception, first come first serve. For more information about the VUB swimmingpool.